We replaced this homeowners roof with new Landmark Pro shingles in the Resawn Shake pattern. Roof replacement isn't something every homeowner or property manager ever looks forward to. If you want to keep your structure, your belongings, and more importantly, your family safe and secure from the elements, then a properly installed roof is a great necessary investment in your home. Replacing a roof can be expensive if you have a large home or even an older home with a roof that has been neglected for many years. If you're searching for a roofing company to take care of your roof replacement from start to finish you'll be glad you've stumbled upon our website. Paragon Exteriors LLC is a roofing contractor that specializes in roof replacement services throughout Waukesha County, Wisconsin. Whether you want to replace the roof on your single family home or a replace the roof on your multi-family dwelling like a condo or a townhome complex our team of factory certified roofers can replace your roof with a more durable, better looking shingle that is covered by a warranty up to 50 years (depending on your choice of shingle). Does the cost of your roof replacement have you stressed out? Don't worry! We offer competitive, low-rate roof replacement financing, where you won't have to make a payment on your new roof for one full year (12 months) if you qualify. Our easy-to-qualify roofing loans ease the financial burden and allow you to spread the cost out over a few years, which makes a roof replacement affordable for almost everyone who needs a new roof. We're a professional team of roofing craftsman at the top of our game, we're not a fly-by-night group of handymen who do roofing on the side. We have a process in place that offers our clients a quick, hassle-free, experience, free from the common problems you hear about roofers. We're focused on quality and excellence and it shows in the glowing reviews we've received from our clients. We aren't the biggest roofing company in Waukesha County but we work really hard to be the BEST. At Paragon Exteriors LLC we offer a different kind of roofing experience, one without the high-pressure sales gimmicks employed by many other local roofers designed to part you from your hard earned money. When you schedule your roof replacement estimate with us we're going to arrive to your home in a marked Paragon truck, you'll know you're dealing with a professional from the moment we pull up to your driveway and introduce ourselves. 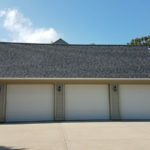 We'll get straight to business and ask you a few questions about your existing roof and then we'll take some quick measurements and do a preliminary inspection of the condition of the roof so we know what we're working with. Once we know the square of your roof (how a roof is measured) we can quickly get down to brass-tacks and explain our pricing structure for your roof replacement based on a good, better, and best selection of high quality roofing shingles. We'll explain the products to you and show you the differences between them, we'll explain how the warranty works, and answer any questions you may have. If you're ready-to-go you can even apply for financing on-the-spot and we'll often have back an approval for you on the very same day. You can have the financial peace-of-mind knowing we offer meet-or-beat pricing and we'll meet or beat any of our competitors quotes on the same roofing materials so long as they are being installed by manufacturer certified roofers, just like us. When you make the decision to hire us for your roof replacement we'll order the materials and book the day your project will start (weather permitting). We'll take care of any permits that are required so you won't have to deal with that hassle either. Depending on how many layers of existing shingles you have on your roof (2 is usually the max) we may or may not have to tear your old roof off. It's common to install a second layer of shingles on top of an existing layer provided the roof decking and roof flashing is in good shape. If we're tearing off the existing layer of shingles then we'll come with our Equipter dumping trailer so we can tear-off and dispose of the old shingles without causing a giant mess on your property or damaging any of your landscaping or gardens. We're one of the only roofing companies in Waukesha that owns an Equipter and offers this level of protection and care for our clients properties. Safety and cleanliness while on your property are very important to every member of our team. If we've torn off the old roofing shingles your roof decking and roof flashing will be exposed. After a thorough inspection we can replace any damaged roof decking if necessary, add any required ventilation, and we'll also install new roof flashing where it is needed. Our attention to detail at this stage is key to ensuring you get the best performance and longevity out of your new roof. We install your new roofing shingles to meet or exceed the manufacturers recommendations so your replacement roof will qualify for the maximum amount of warranty. 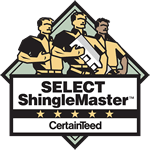 This includes using a proper ice and water shield, installing quality roof flashing that fits like a glove, and we always use additional high quality fasteners to secure the shingles. Our roofing crews are factory certified and our roof replacements are inspected by the roofing manufacturer to ensure the highest quality standards are always met and so they can sign-off on your warranty. When we're done with your roof replacement you won't even know we were on your property aside from the fantastic new roof on your home or building. We clean up all debris, we use magnetic rollers to collect any roofing nails that may have fallen and we properly dispose of your old shingles. We watch out for your property and treat your home as if it were our own. We offer FREE annual roof inspections for all of our roof replacement clients. Once a year, we'll come out and do a quick inspection of your roof, making sure everything is performing as it should be and we'll take care of any issues we find with the shingles or our workmanship for as long as you are the owner of the home. This is a question everyone wants to know before calling a roofing company and it's a tough question to answer accurately without knowing more information about your home and existing roof. How many square feet is your home? How many layers of existing shingles do you already have? Are there other roof repairs that will be required? What type of new shingle do you want installed? In order to give you an accurate roof replacement cost we'd need to know the answers to these questions. If you'd like to know the a ballpark price range most of the homes we replace roofs on come out around $7,000 to $20,000 or more depending on the variables above. How Long Does Roof Replacement Take? The roof can be replaced on an average home in Wisconsin in usually 1 to 3 days. If you have a much larger home, a multi-family dwelling such as a condo or a townhome, then your roof replacement will take a bit longer. This time frame includes tearing off the old roof, installing the new shingles, and cleaning up the job site when we're finished. Weather can sometimes stretch a timeline out as well. How Long Does The Warranty Last On My New Roof? Depending on the shingles you decide to go with your materials warranty could be 25-50 years. Some of the warranties are pro-rated and others are not, it really depends on the shingles you've chosen. Paragon Exteriors LLC also offers a lifetime workmanship warranty on our installations for as long as you own the home. Are You Ready To Become Another Satisfied Paragon Exteriors LLC Roof Replacement Customer? A Paragon Truck Outside A Recent Roof Replacement Project. Replacing your roof doesn't have to be a hassle or stressful. When you hire a professional team like Paragon Exteriors LLC you're partnering with professionals who take the investment you're making into your home or building very seriously. Our goal is complete customer satisfaction and we achieve that by exceeding your expectations with every aspect of your roof replacement. With Paragon, you're roof replacement is truly in excellent hands. 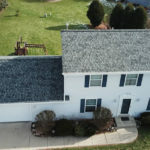 If you'd like to schedule your roof replacement quote with Paragon Exteriors LLC it's as simple as giving us a call (262) 565-8282 or filling out our online contact form and we'll get right back to you. Jake did an excellent job when it came to accommodating our schedule. He made several trips to our home and answered our numerous questions very quickly. Additionally, with a winter storm inbound, his team arrived earlier and stayed later in order to turn a 3 day job into 2. We were referred to Paragon from multiple previous customers and would recommend them to others without hesitation. "Hi Jake, I thought I would let you know that it seems the roof repairs and replacement you did for us last year really did the trick. I have noticed we have not had any icicles hanging off our eaves whatsoever this year, no leaks, no issues. This must be in due part to Paragon correcting our ventilation problems - so THANK YOU!!"